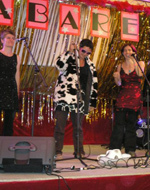 Jamie Dawes, Jenny Warne, Dave the Dude and Roxane Smith sang together in a quartet called The Harrys. I performed with ‘Cowin Lush’, an a capella trio based in Swansea. 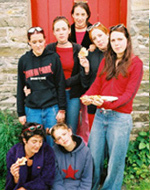 I set up a choir for teenagers called ‘One Cake Down’. 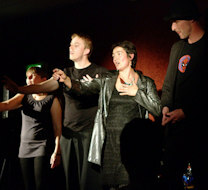 We produced one CD and did one fabulous and funny performance. I worked as conductor for the Centre for Performance Research on a ‘Travels with my Uncle’ - an a capella piece by Karl Jenkins for the Community Choirs of Wales. 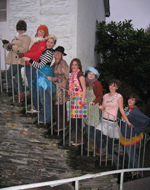 I was employed by Welsh National Opera to devise and run workshops in 30 schools throughout Pembrokeshire and Powys. 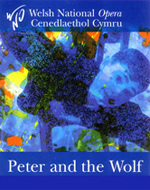 The themes of the workshops were inspired by ‘Peter and the Wolf’. I was asked by a group of teenage girls to help them sing together in harmony. This became ‘Curiad’ and over a period of 2 years we produced 2 albums, and did 3 performances in the first 8 months.